Nominate someone now for student or educator in 2018-19. The Lakers are proud to announce the November 2018 Student and Educator of the Month winners! This month’s student winners are Hailey Aiden, Adriana Ochoa and Tristan Hguyen. The winning teachers are Gitanjalie Misra, Mauricio Leal and Frances Weissenberger. Each winner demonstrates an outstanding commitment to academia, athletics, and community outreach. Hailey Aiden, an exceptional 11th grade student at Granada Hills Charter High School. Hailey excels in the classroom and carries a 4.4 GPA. On top of her school work, she is a dedicated student athlete and stars on the girls Varsity basketball team. Adriana Ochoa, a selfless 8th grade student at Olive Vista Middle school, who is known for putting others needs before her own. She tutors other students in her class and volunteers at the school library. She balances being part of the school’s band and drill teams all while earning honor roll grades each year. In her free time, Adriana also volunteers with Heal the Bay and participates in the American Cancer Society Relay for Life. Tristan Nguyen, a hardworking 3rd grade student at Durfee-Thompson Elementary School. He excels in math and reading and is always looking for ways to push himself. Tristan is known to be a leader in his class, and is constantly looking to help others with their math and reading assignments. Gitanjalie Misra, a top-notch math teacher Thomas Starr King Middle School. Ms. Misra is like a mother to many of her students. She is always willing to help, and constantly goes the extra mile in support of students, parents, teachers and the community. Mauricio Leal, a dedicated math Teacher at James A. Garfield High School. He is a mentor to many of his students and has been instrumental in helping his students reach their goal of going to college! He also takes the time to tutor students after school and spends many hours preparing assemblies, professional development, and community events for students, teachers and community members. Frances Weissenberger, is the principal at Quail Summit Elementary. Ms. Weissenberger constantly encouraging her students and lifting the spirits of those around her. In just her second year as Principal, she has done an exceptional job leading by the example and showing her students the importance of kindness. 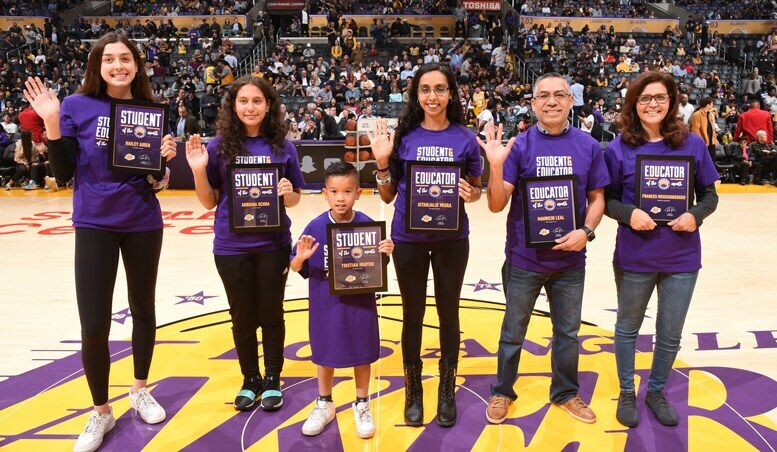 Each Student and Educator of the Month winner was invited to the home game on November 7, 2018 vs. the Minnesota Timberwolves. They were honored during a halftime presentation where they received a plaque and a Lakers Student and Educator of the Month t-shirt. The nominations for the November Student and Educator of the Month were submitted by principals and teachers of each school based on exemplary teaching efforts, academic achievement or extracurricular activities.